The latest SwiftKey update includes a dedicated search bar that allows you to look up things on the web via Bing, then share those things if you so choose in a very expeditious manner. 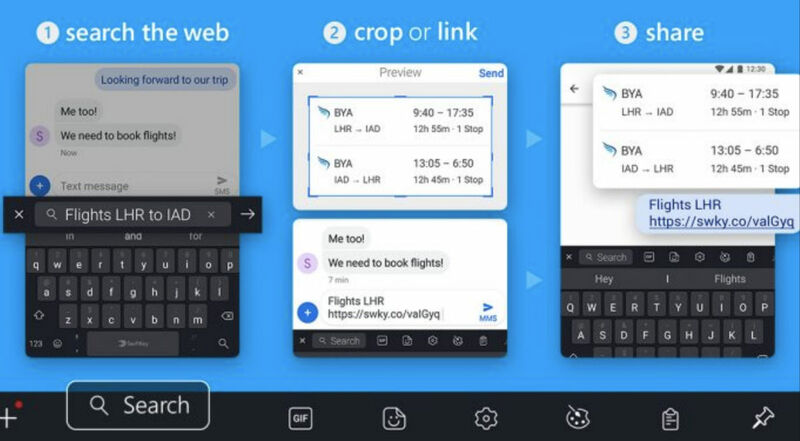 For example, you can Bing flights, then screenshot and share flight times with friends, all without having to leave SwiftKey. To use this new feature, open the Toolbar by tapping the “+” on the top left, select the search icon, then type what you’re looking for into the box. If you type a specific search term, you’ll find instant access to rich search content from Bing. However, if you type in a URL, you’ll be taken to that webpage. Regardless of what you searched for, you’ll be able to snap a shot of the results, then share them directly in a message via SwiftKey. You’re essentially cutting out the middleman, and in this case, that would most likely be Google. Instead of leaving your message and heading into Google to search for something and then sharing results, everything happens in SwiftKey. It makes complete sense, but still, it’s Bing. After looking at a few reviews of the recent update, not everyone is thrilled with the addition. Personally, I haven’t used SwiftKey in quite some time, but if you’re a SwiftKey faithful, we’d love to hear your take on the latest update. Go grab it, then share your thoughts down below.